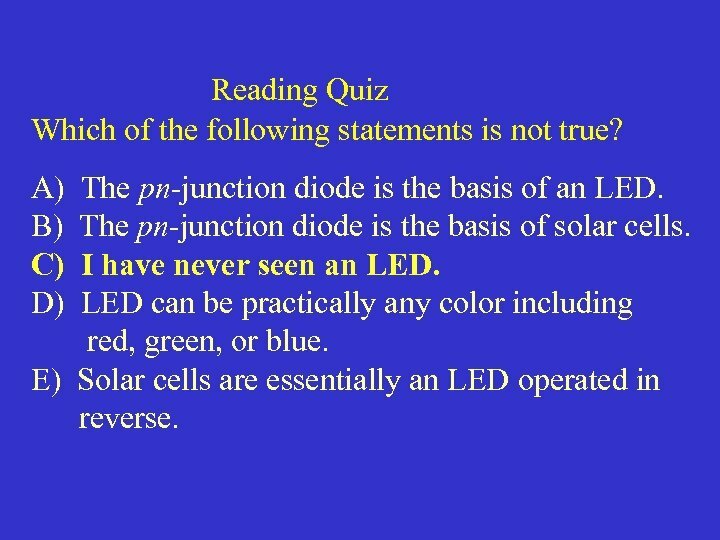 Reading Quiz Which of the following statements is not true? A) B) C) D) The pn-junction diode is the basis of an LED. The pn-junction diode is the basis of solar cells. I have never seen an LEDs can be practically any color including red, green, or blue. 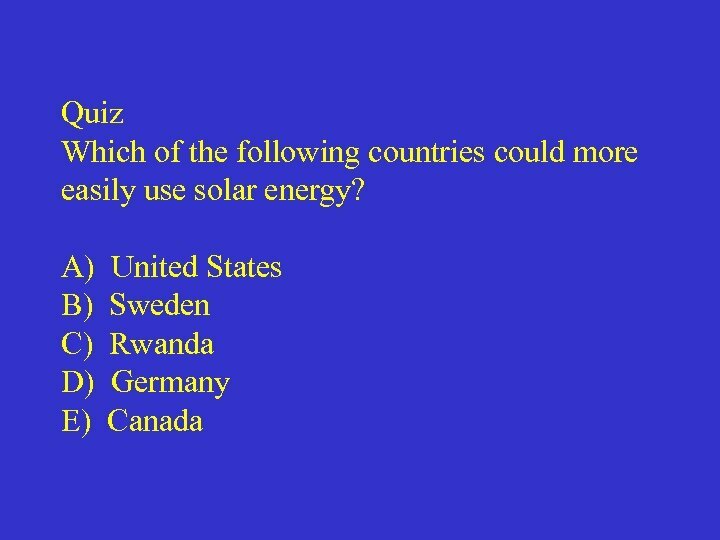 E) Solar cells are essentially an LED operated in reverse. 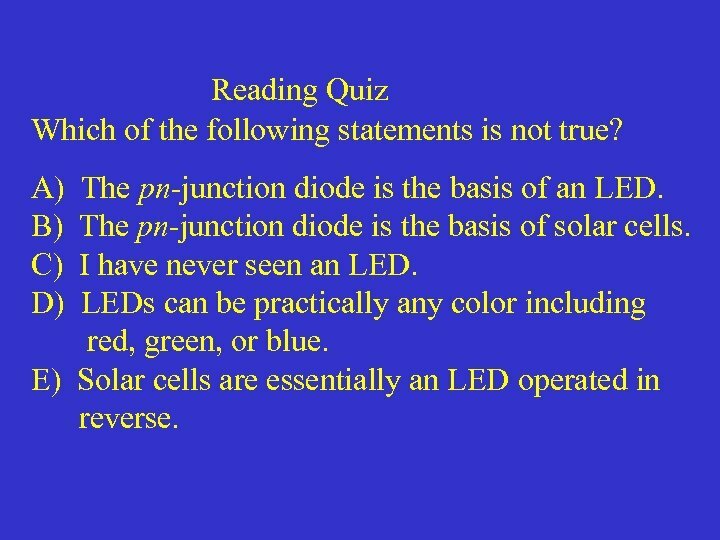 Reading Quiz Which of the following statements is not true? A) B) C) D) The pn-junction diode is the basis of an LED. The pn-junction diode is the basis of solar cells. I have never seen an LED can be practically any color including red, green, or blue. 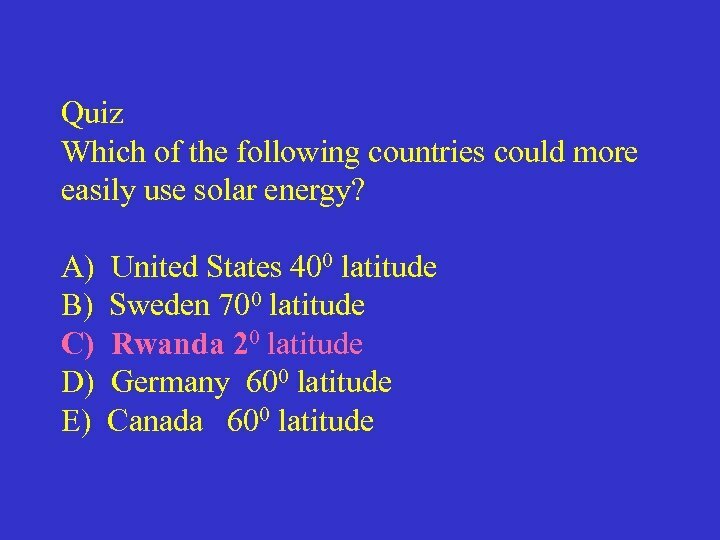 E) Solar cells are essentially an LED operated in reverse. 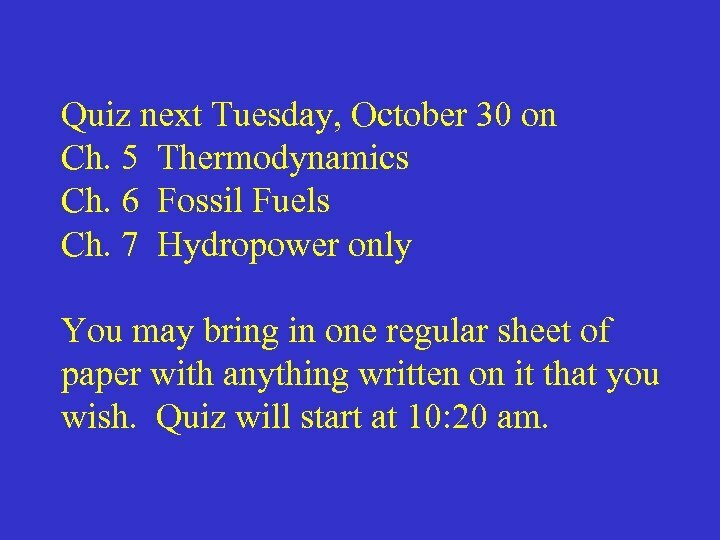 Quiz next Tuesday, October 30 on Ch. 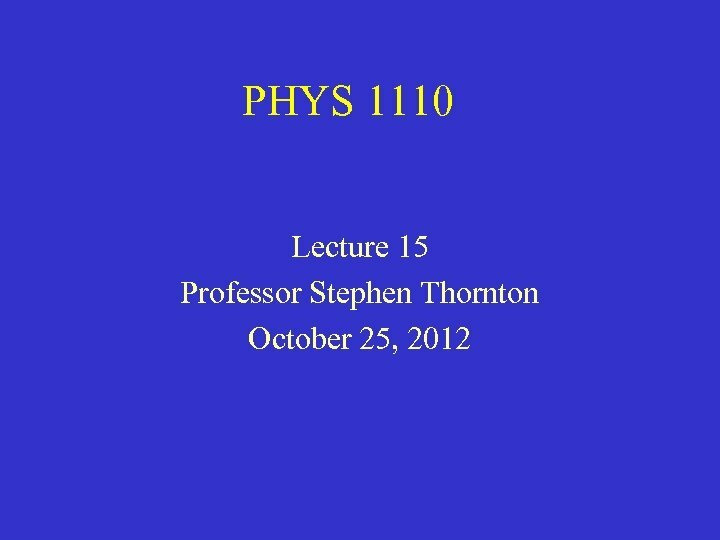 5 Thermodynamics Ch. 6 Fossil Fuels Ch. 7 Hydropower only You may bring in one regular sheet of paper with anything written on it that you wish. Quiz will start at 10: 20 am. We add impurities to semiconductors to make them better conductors. Add arsenic to have one extra electron (ntype) and boron to have an extra hole (ptype). They become much better conductors of electricity. 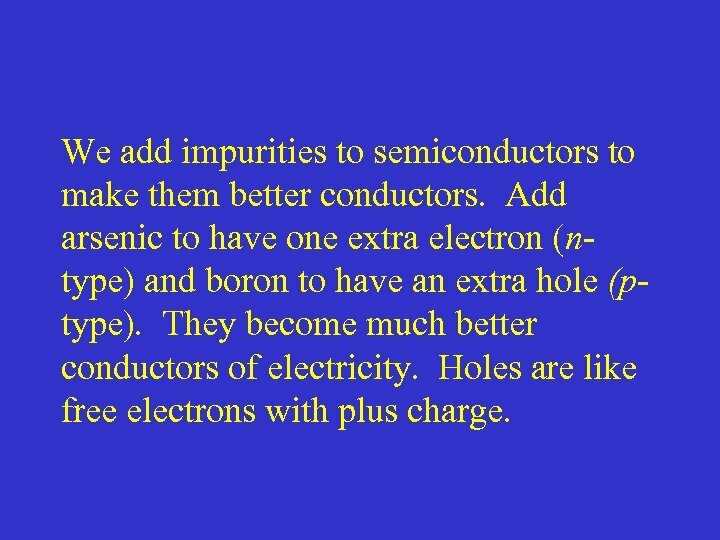 Holes are like free electrons with plus charge. 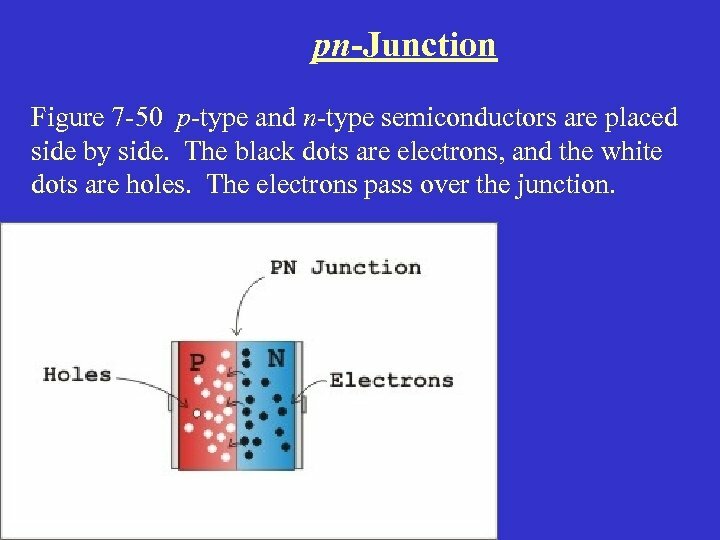 pn-Junction Figure 7 -50 p-type and n-type semiconductors are placed side by side. The black dots are electrons, and the white dots are holes. The electrons pass over the junction. 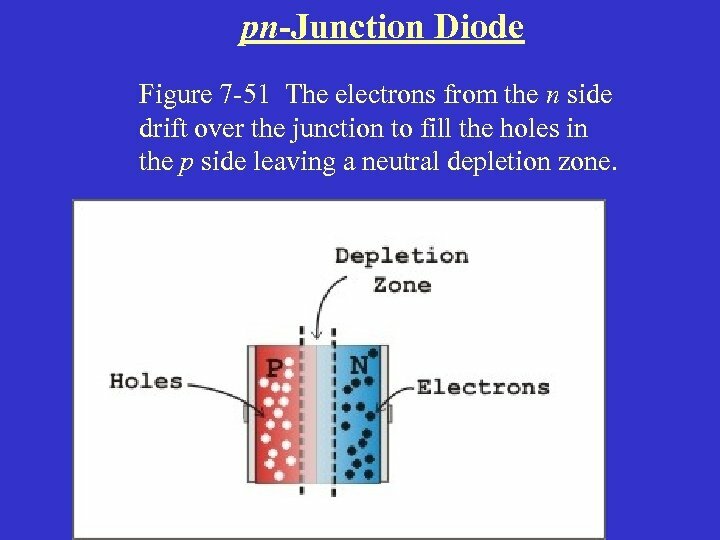 pn-Junction Diode Figure 7 -51 The electrons from the n side drift over the junction to fill the holes in the p side leaving a neutral depletion zone. 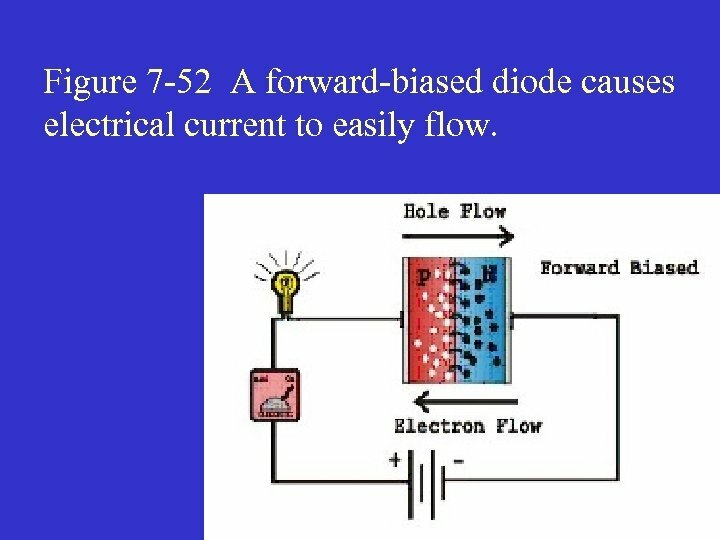 Figure 7 -52 A forward-biased diode causes electrical current to easily flow. 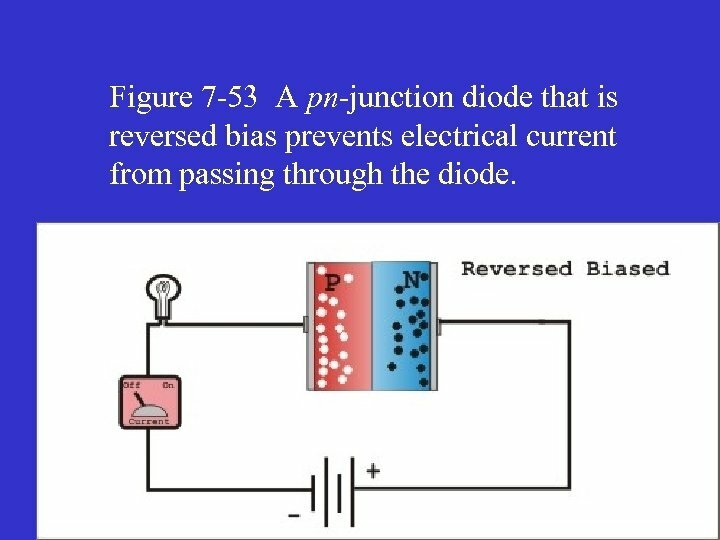 Figure 7 -53 A pn-junction diode that is reversed bias prevents electrical current from passing through the diode. Figure 7 -55 Schematic process of a solar cell. 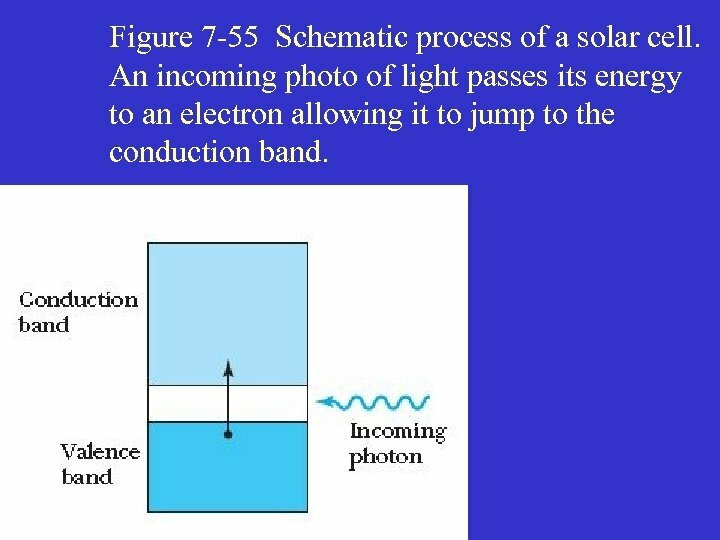 An incoming photo of light passes its energy to an electron allowing it to jump to the conduction band. 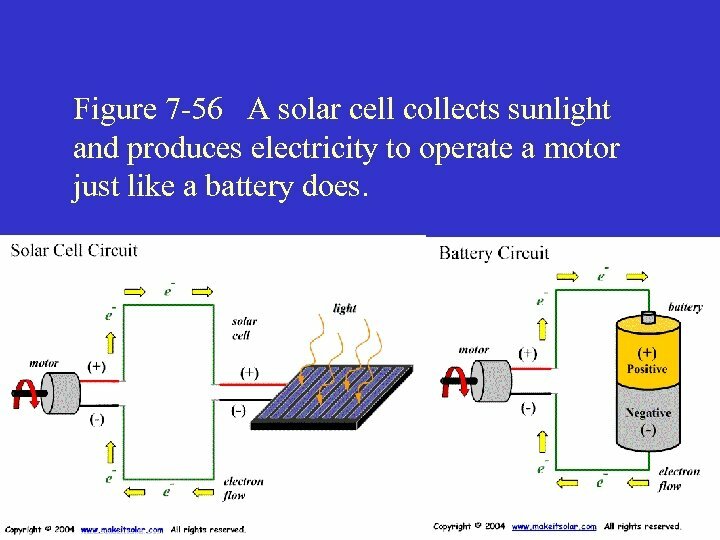 Figure 7 -56 A solar cell collects sunlight and produces electricity to operate a motor just like a battery does. 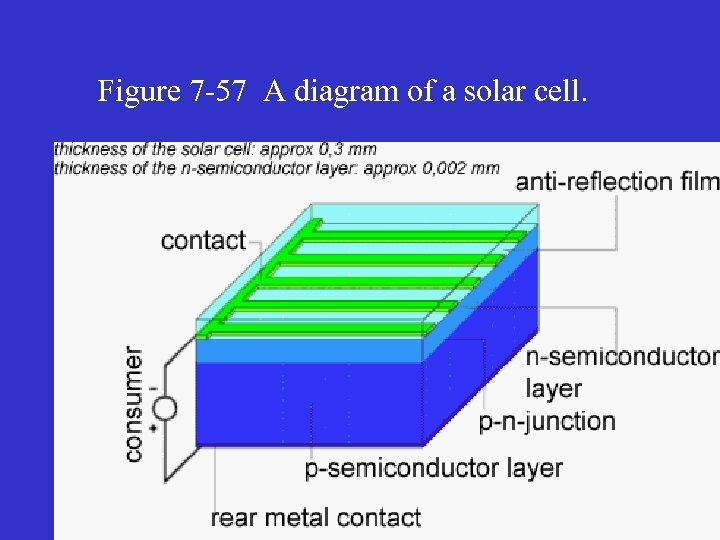 Figure 7 -57 A diagram of a solar cell. 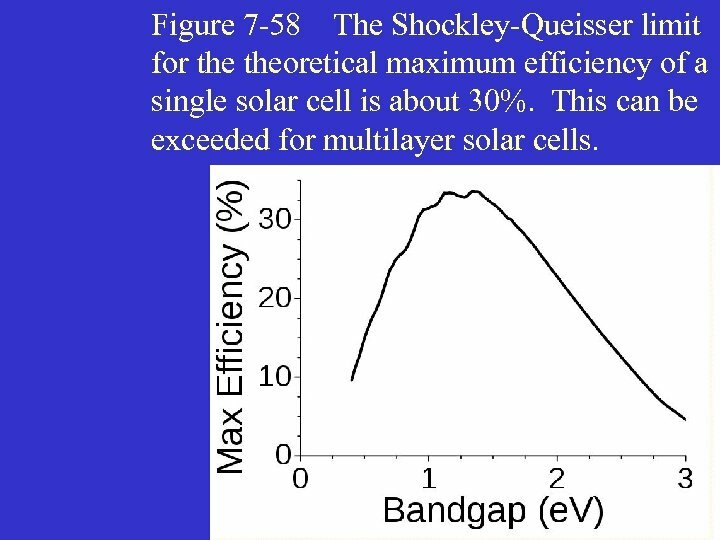 Figure 7 -58 The Shockley-Queisser limit for theoretical maximum efficiency of a single solar cell is about 30%. This can be exceeded for multilayer solar cells. 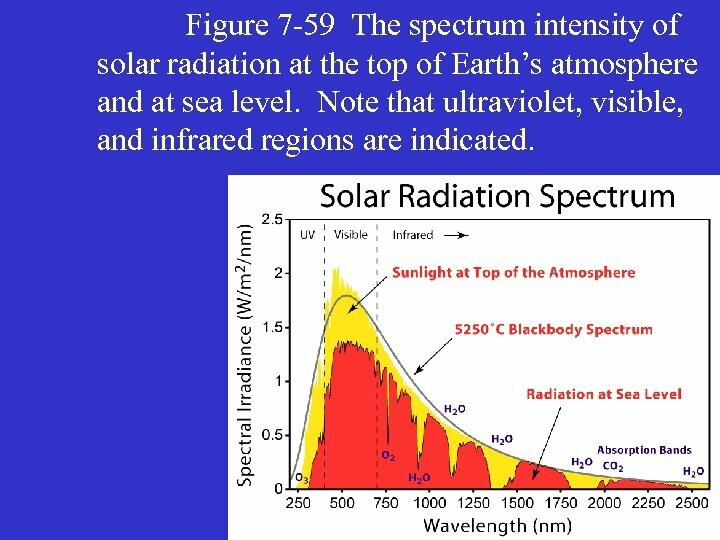 Figure 7 -59 The spectrum intensity of solar radiation at the top of Earth’s atmosphere and at sea level. Note that ultraviolet, visible, and infrared regions are indicated. 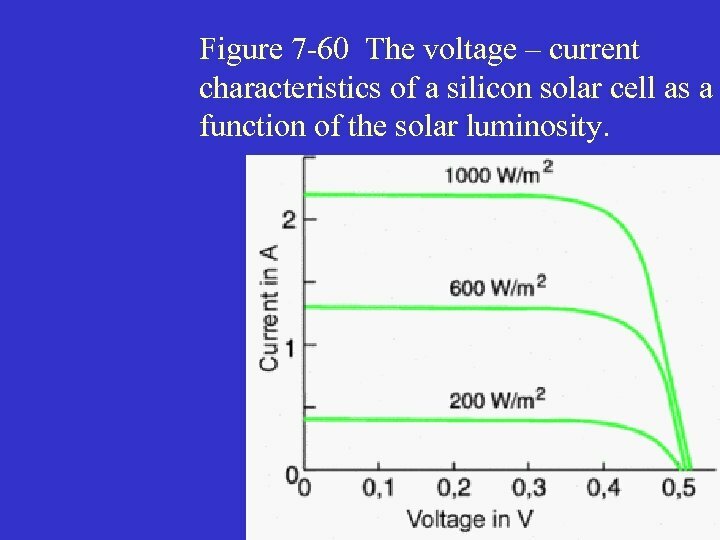 Figure 7 -60 The voltage – current characteristics of a silicon solar cell as a function of the solar luminosity. Quiz Which of the following statements is not true? A) B) C) D) E) Electrons can be in valence bands. Electrons cannot be in energy gaps. 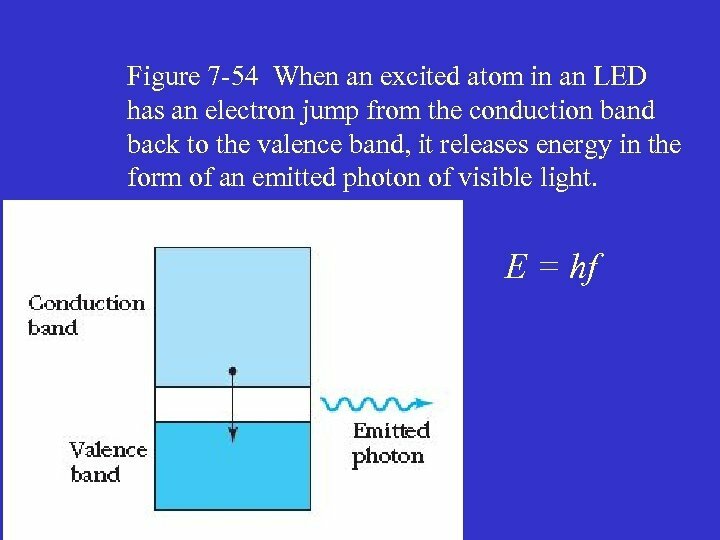 Electrons can be in conduction bands. Holes are normally in the conduction band. Holes are normally in the valence band. Quiz Which of the following statements is not true? 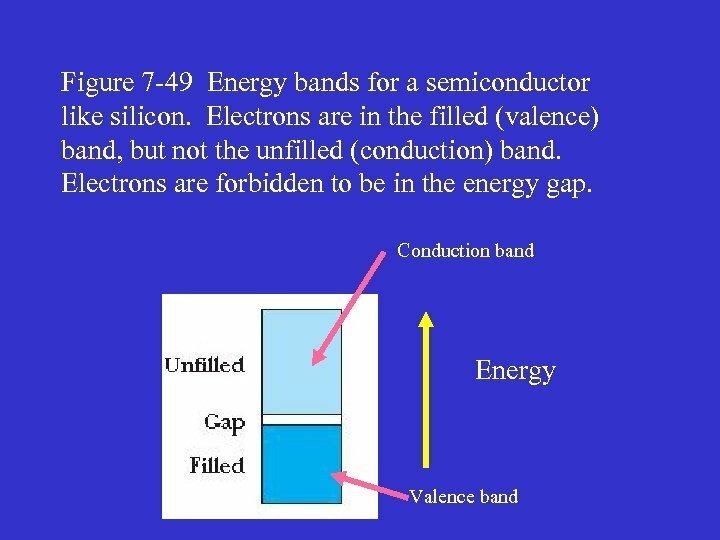 A) Electrons can be in valence bands. B) Electrons cannot be in energy gaps. C) Electrons can be in conduction bands. 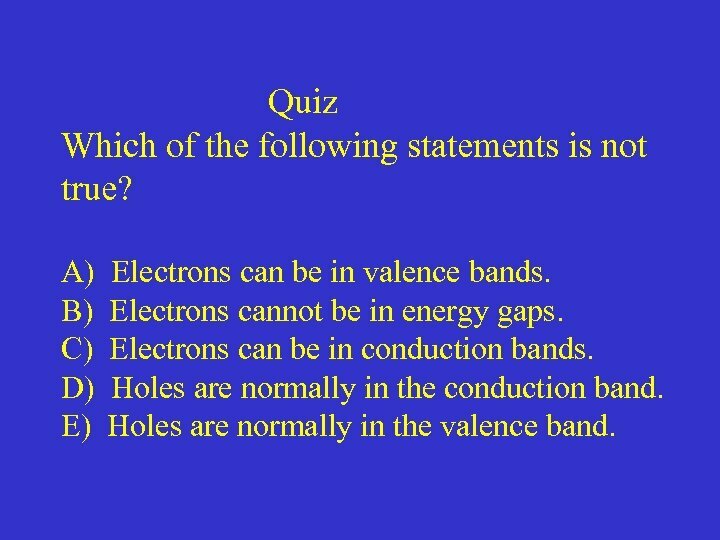 D) Holes are normally in the conduction band. 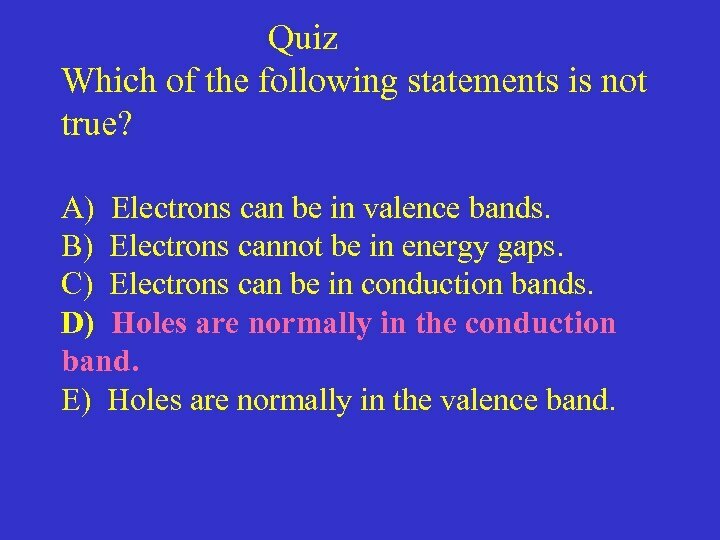 E) Holes are normally in the valence band. 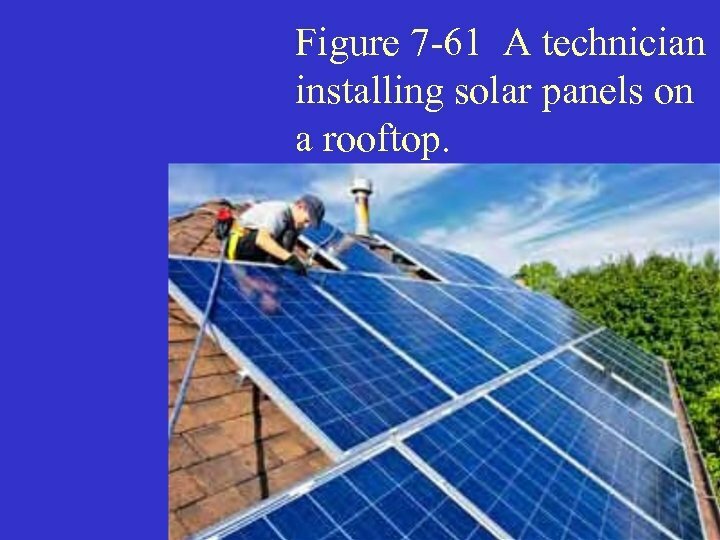 Figure 7 -61 A technician installing solar panels on a rooftop. 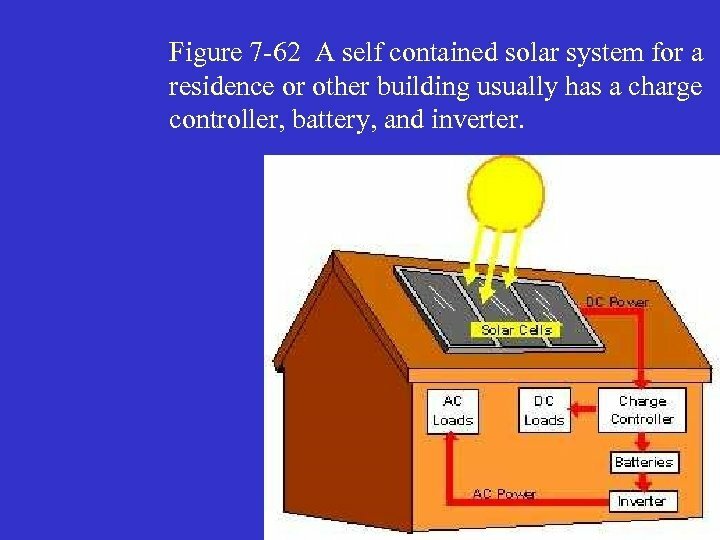 Figure 7 -62 A self contained solar system for a residence or other building usually has a charge controller, battery, and inverter. 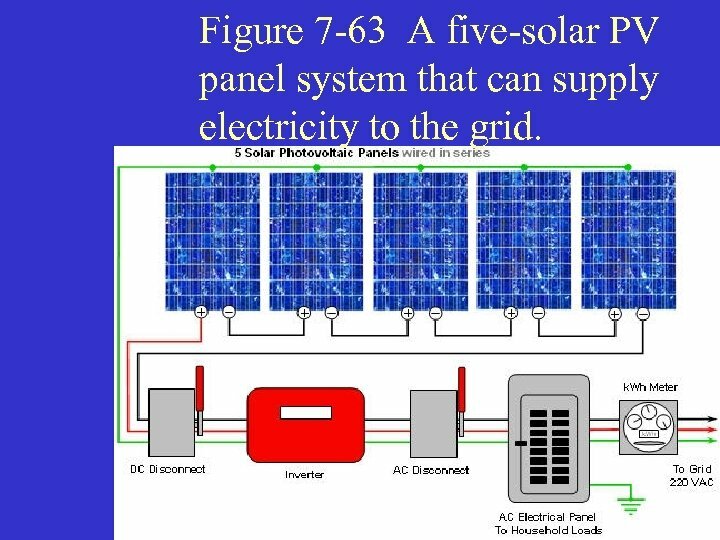 Figure 7 -63 A five-solar PV panel system that can supply electricity to the grid. There are many large PV power stations in the United States and the World. The largest is a 200 MW plant in China named Golmud Solar Park. It produces 317 GWh of energy annually and has a capacity factor of 18%. The second largest, and the largest until 2011, is the Sarnia PV Power Plant in Canada, which has 97 MW nominal power, production of 120 GWh, and a capacity factor of 17%. 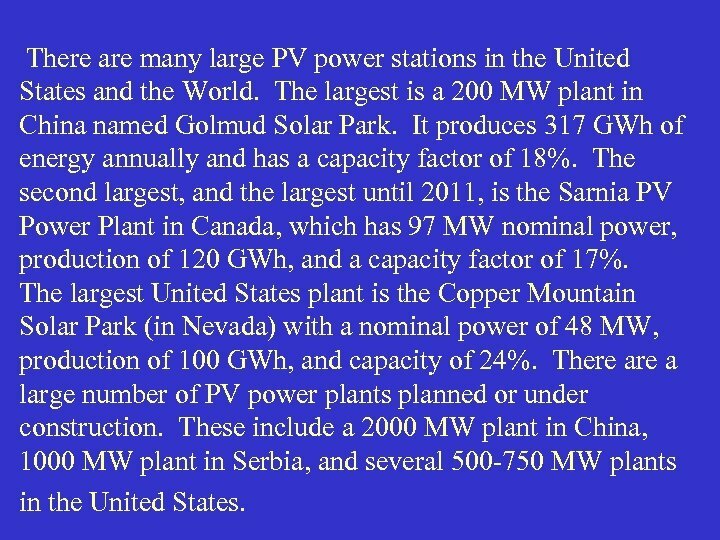 The largest United States plant is the Copper Mountain Solar Park (in Nevada) with a nominal power of 48 MW, production of 100 GWh, and capacity of 24%. There a large number of PV power plants planned or under construction. These include a 2000 MW plant in China, 1000 MW plant in Serbia, and several 500 -750 MW plants in the United States. Despite the rapid growth of solar PV power since the late 1990 s, solar power accounts for less than 1% of the United States electrical use. Germany has by far the largest use of solar power, partly due to feed-in tariffs that guarantee that utility companies will purchase the solar power at a high, fixed price. The United States also has had large incentives along with many states, especially California, but electricity still remains relatively cheap in the US, and solar power produced electricity is still more than twice as expensive as hydro, coal, oil, and nuclear power. 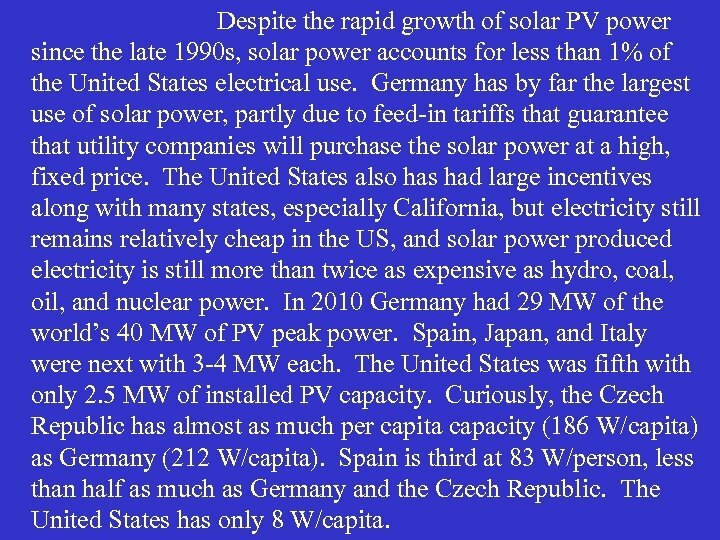 In 2010 Germany had 29 MW of the world’s 40 MW of PV peak power. Spain, Japan, and Italy were next with 3 -4 MW each. The United States was fifth with only 2. 5 MW of installed PV capacity. Curiously, the Czech Republic has almost as much per capita capacity (186 W/capita) as Germany (212 W/capita). Spain is third at 83 W/person, less than half as much as Germany and the Czech Republic. The United States has only 8 W/capita. Chinese solar cell manufacturers have captured most of the world’s market in recent years with the help of lavish government subsidies of low loan rates, cheap or free government owned land, and large economies of scale. China has the top four manufacturers and 7 of the top 10. Taiwan has the other three. No European or United States manufacturers are in the top ten. Regarding the top ten companies producing solar modules, eight are Chinese, one is German, and one (Sunpower) is US. 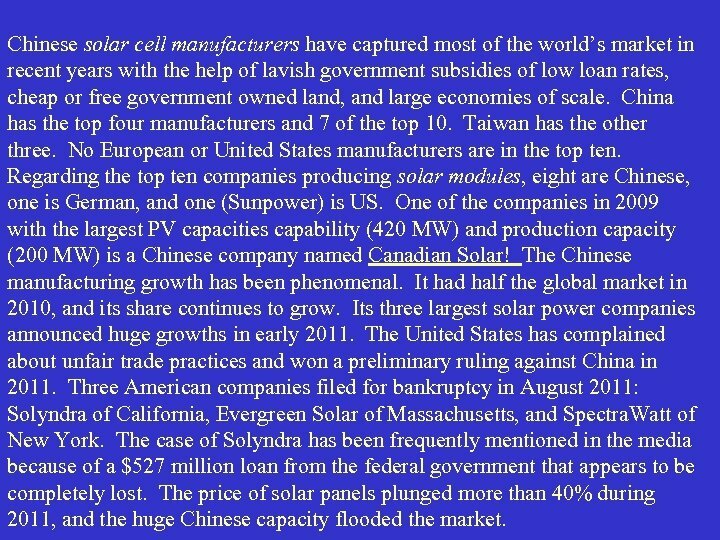 One of the companies in 2009 with the largest PV capacities capability (420 MW) and production capacity (200 MW) is a Chinese company named Canadian Solar! The Chinese manufacturing growth has been phenomenal. It had half the global market in 2010, and its share continues to grow. Its three largest solar power companies announced huge growths in early 2011. The United States has complained about unfair trade practices and won a preliminary ruling against China in 2011. Three American companies filed for bankruptcy in August 2011: Solyndra of California, Evergreen Solar of Massachusetts, and Spectra. Watt of New York. The case of Solyndra has been frequently mentioned in the media because of a $527 million loan from the federal government that appears to be completely lost. The price of solar panels plunged more than 40% during 2011, and the huge Chinese capacity flooded the market. 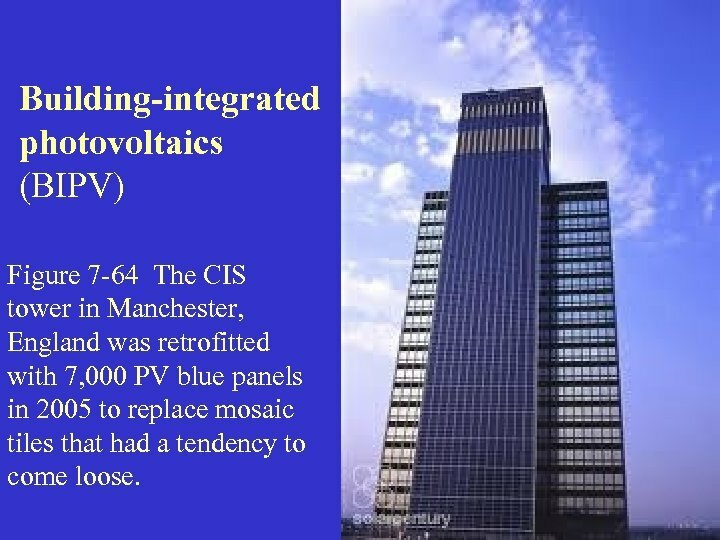 Building-integrated photovoltaics (BIPV) Figure 7 -64 The CIS tower in Manchester, England was retrofitted with 7, 000 PV blue panels in 2005 to replace mosaic tiles that had a tendency to come loose. Generations of Solar Cells First generation solar cells are primarily the large, monocrystal silicon PV cells that continue to dominate the market. Despite high manufacturing costs, these cells, consisting of silicon wafers, have higher efficiency and account for more than 80% of the market. 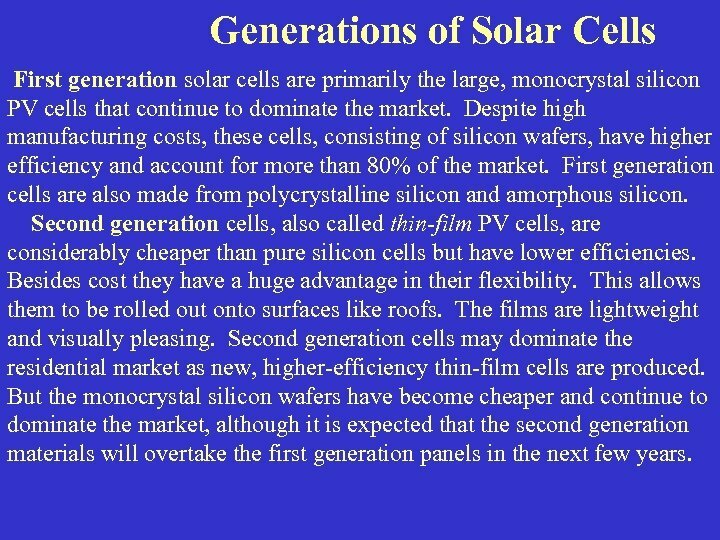 First generation cells are also made from polycrystalline silicon and amorphous silicon. Second generation cells, also called thin-film PV cells, are considerably cheaper than pure silicon cells but have lower efficiencies. Besides cost they have a huge advantage in their flexibility. This allows them to be rolled out onto surfaces like roofs. The films are lightweight and visually pleasing. Second generation cells may dominate the residential market as new, higher-efficiency thin-film cells are produced. But the monocrystal silicon wafers have become cheaper and continue to dominate the market, although it is expected that the second generation materials will overtake the first generation panels in the next few years. Third generation cells are at the cutting edge of technology. These are still in the research phase and do not require pn-junction diodes. There is a wide range of possibilities including polymers, nanocystals, and dye-sensitive solar cells. It is hoped that these new cells will overcome the Shockley-Queisser limit of 31 -41% efficiency for single bandgap solar cells. The efficiencies can be improved by stacking very thin cells with different bandgaps on top of each other – called the tandem cell or multi-junction approach. Gallium arsenide (Ga. As) cells with three layers currently hold the experimental record of 41. 6% efficiency. First generation cells currently have the highest efficiencies, while second generation cells are cheaper with acceptable efficiencies. 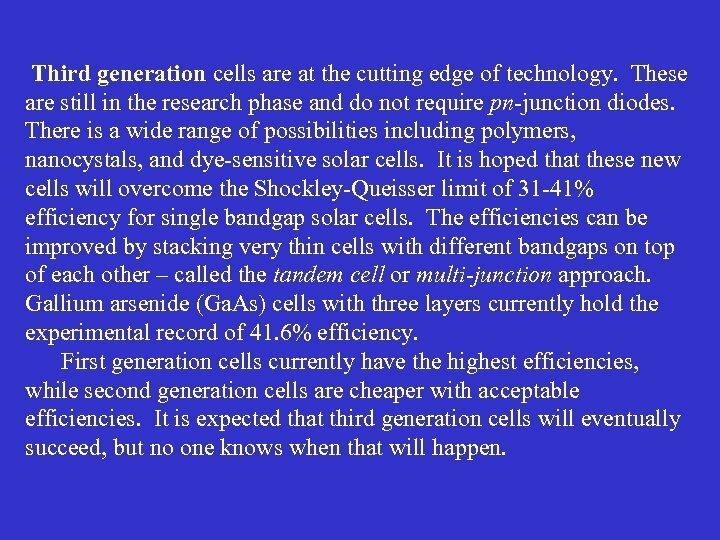 It is expected that third generation cells will eventually succeed, but no one knows when that will happen. 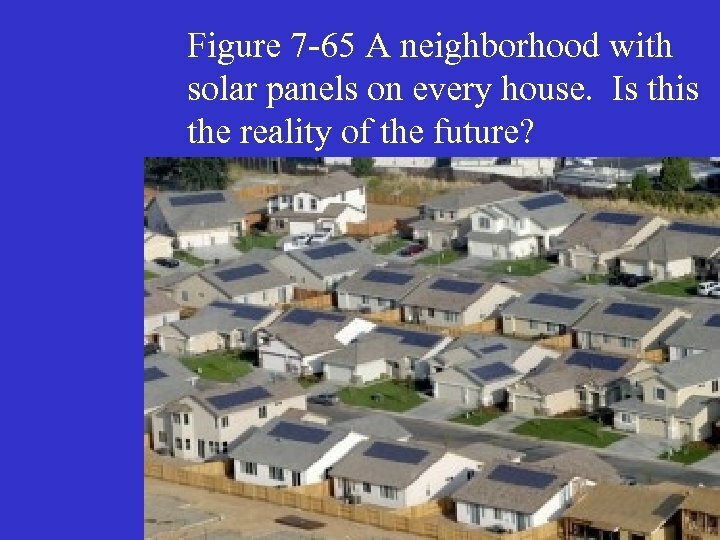 Figure 7 -65 A neighborhood with solar panels on every house. Is this the reality of the future? Figure 7 -66 Location of the Mojave and Sonoran deserts in California, Nevada, Utah, Arizona and Mexico cover 376, 000 km 2. 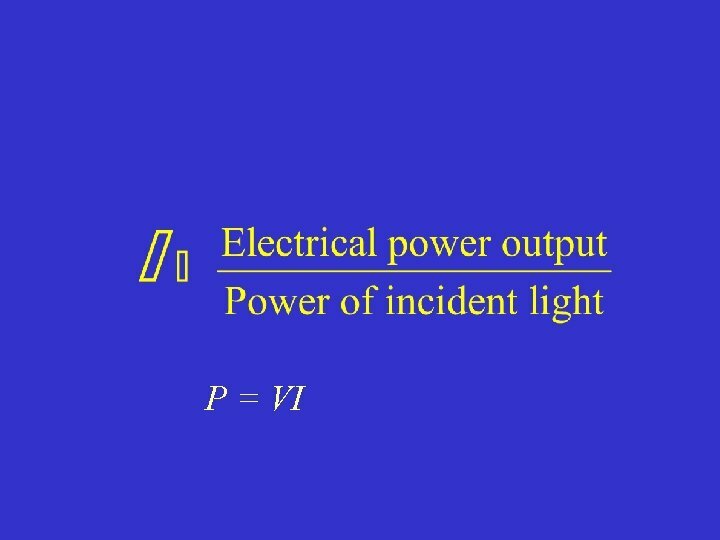 Calculate how much power can be produced. Use an existing solar farm as model. International as well as American Energy Associations expect that the combination of PV and CSP may produce as much as 25% of the world’s electricity needs by 2050. This is not an unreasonable estimate based on expected technology and conservation efforts. It has been estimated that an area of 26, 000 km 2 is needed to supply all the electricity required by the United States. Is this large? It is only a square about 100 miles on each side. The Mojave Desert in California, Nevada, Utah, and Arizona covers 65, 000 km 2 so only 40% of it would be needed. 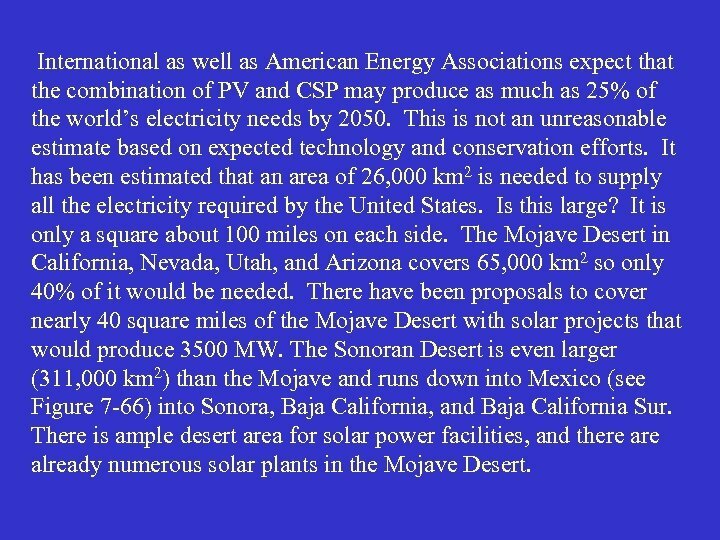 There have been proposals to cover nearly 40 square miles of the Mojave Desert with solar projects that would produce 3500 MW. 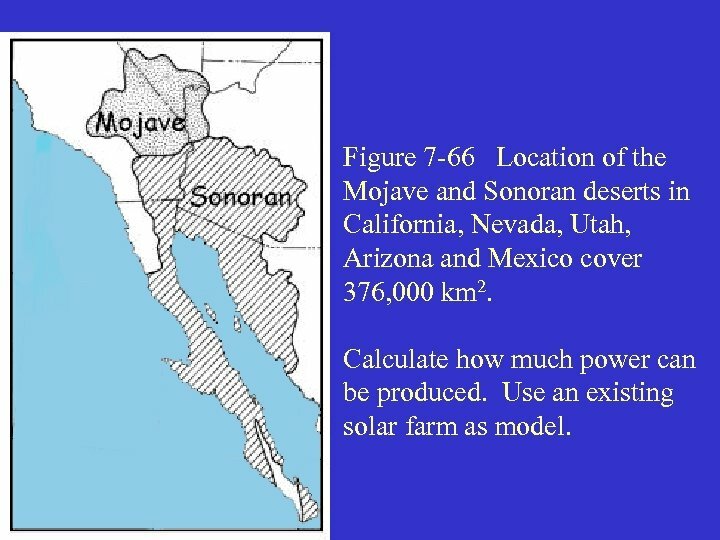 The Sonoran Desert is even larger (311, 000 km 2) than the Mojave and runs down into Mexico (see Figure 7 -66) into Sonora, Baja California, and Baja California Sur. 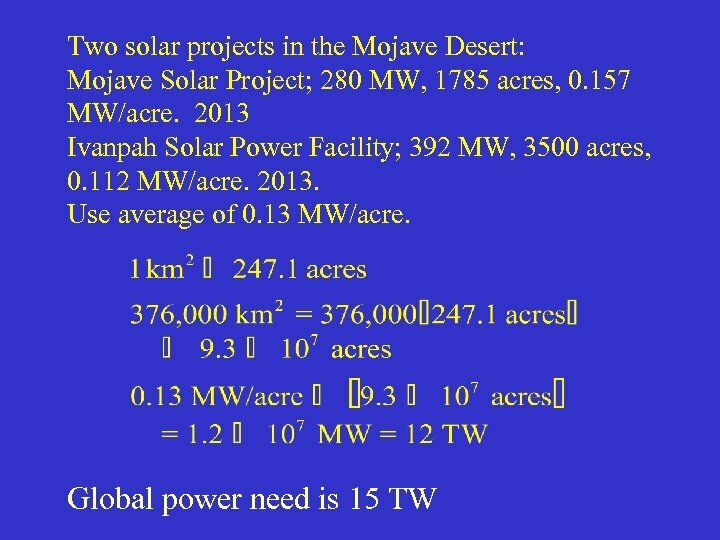 There is ample desert area for solar power facilities, and there already numerous solar plants in the Mojave Desert. In the late 1970 s President Jimmy Carter and Congress passed renewable energy incentives. 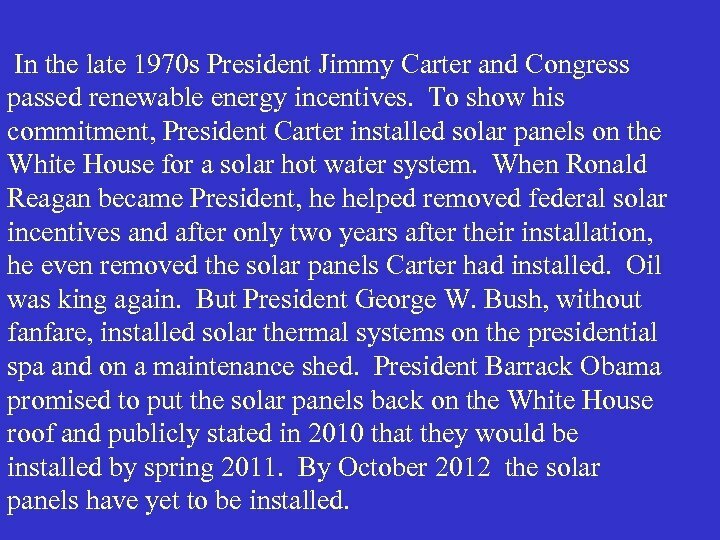 To show his commitment, President Carter installed solar panels on the White House for a solar hot water system. 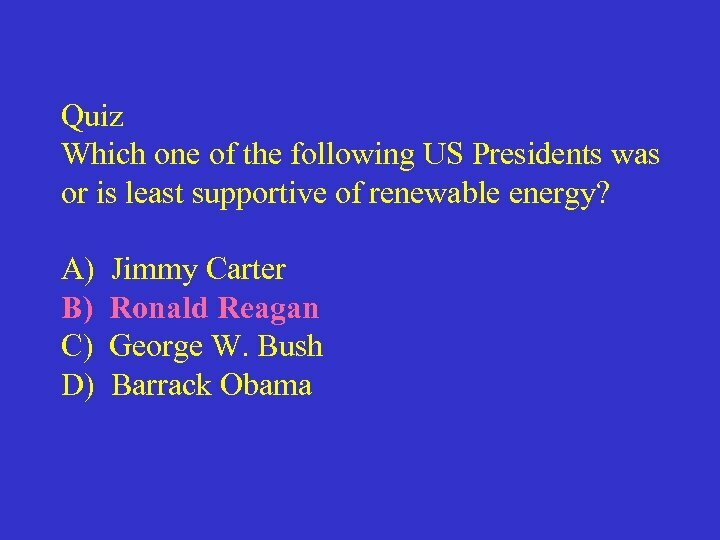 When Ronald Reagan became President, he helped removed federal solar incentives and after only two years after their installation, he even removed the solar panels Carter had installed. Oil was king again. But President George W. Bush, without fanfare, installed solar thermal systems on the presidential spa and on a maintenance shed. President Barrack Obama promised to put the solar panels back on the White House roof and publicly stated in 2010 that they would be installed by spring 2011. By October 2012 the solar panels have yet to be installed. 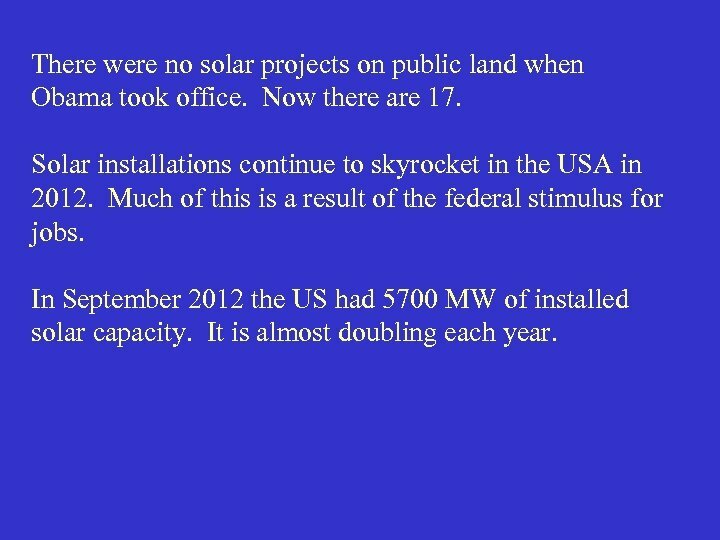 There were no solar projects on public land when Obama took office. Now there are 17. Solar installations continue to skyrocket in the USA in 2012. Much of this is a result of the federal stimulus for jobs. 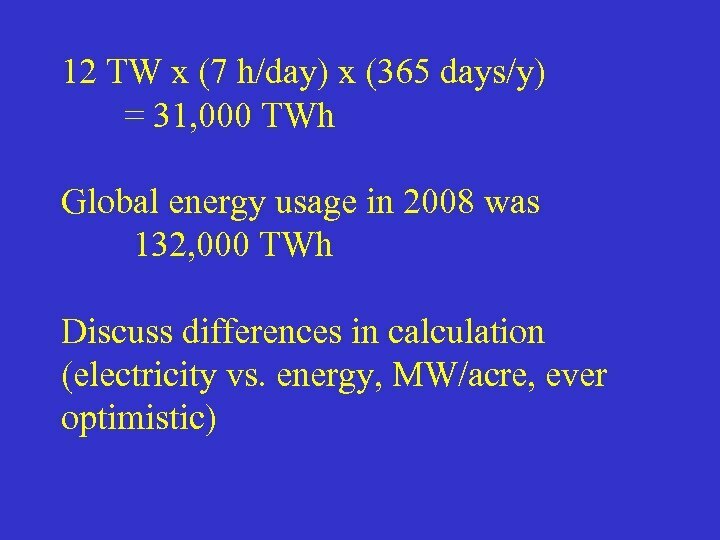 In September 2012 the US had 5700 MW of installed solar capacity. It is almost doubling each year. 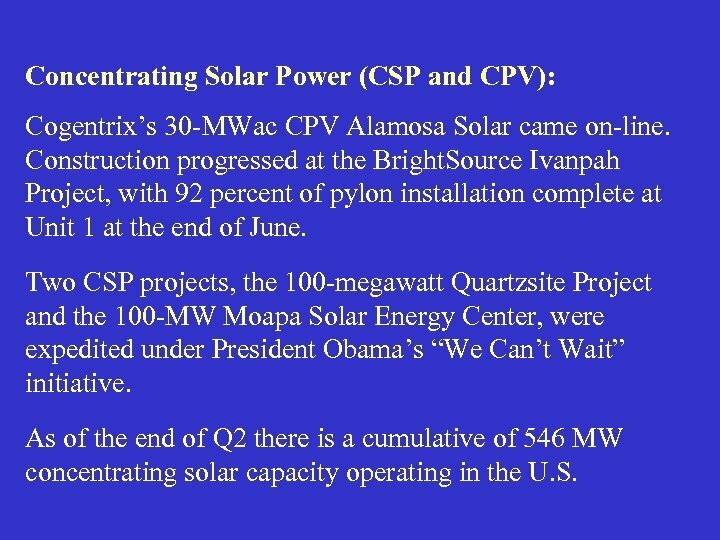 Concentrating Solar Power (CSP and CPV): Cogentrix’s 30 -MWac CPV Alamosa Solar came on-line. Construction progressed at the Bright. Source Ivanpah Project, with 92 percent of pylon installation complete at Unit 1 at the end of June. Two CSP projects, the 100 -megawatt Quartzsite Project and the 100 -MW Moapa Solar Energy Center, were expedited under President Obama’s “We Can’t Wait” initiative. As of the end of Q 2 there is a cumulative of 546 MW concentrating solar capacity operating in the U. S.
Photovoltaics (PV): PV installations totaled 742 MW in Q 2 2012, up 45 % over Q 1 2012 and 116% over Q 2 2011. The residential market remained relatively flat in Q 2, while the non-residential market shrank 33% on a quarterly basis. 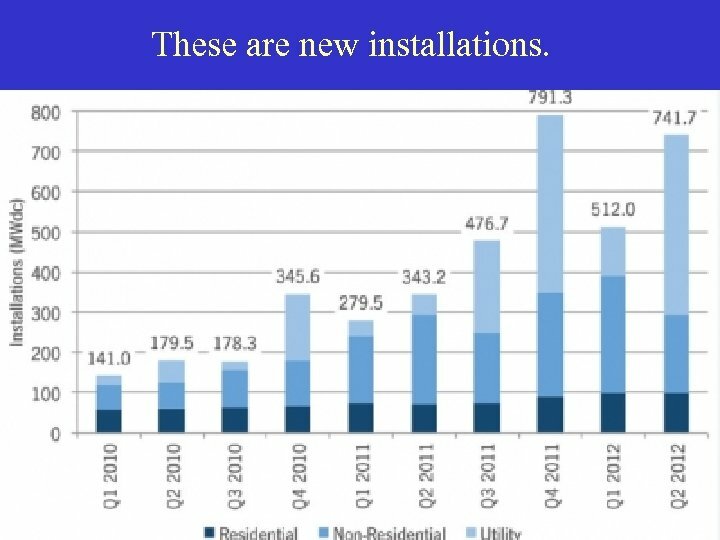 Q 2 2012 was the largest quarter ever for utility PV installations, as more than 20 projects were completed, totaling 447 MW. There is now a cumulative 5, 161 MW of PV capacity spread amongst nearly 248, 000 individual systems operating in the U. S. as of the end of Q 2. GTM Research forecasts that 3. 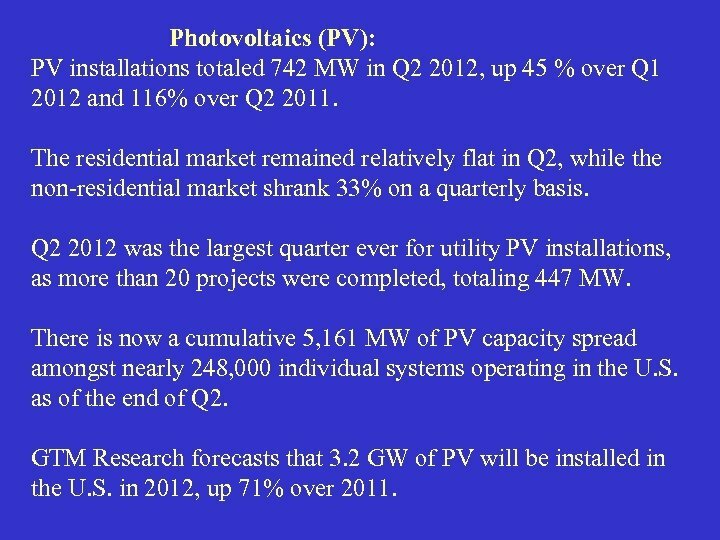 2 GW of PV will be installed in the U. S. in 2012, up 71% over 2011.